What a great weekend even if it didn't end well. It started well, motored down the New River and it was surprisingly busy for a Thursday, but no big deal. We anchored in Lake Sylvia around 4pm. It took two attempts to dig in the anchor, but then it was a relaxed night. Diversion was on the East side of the lake. We took the chance to enjoy the new TV on board, and I found my new Favorite Rum. 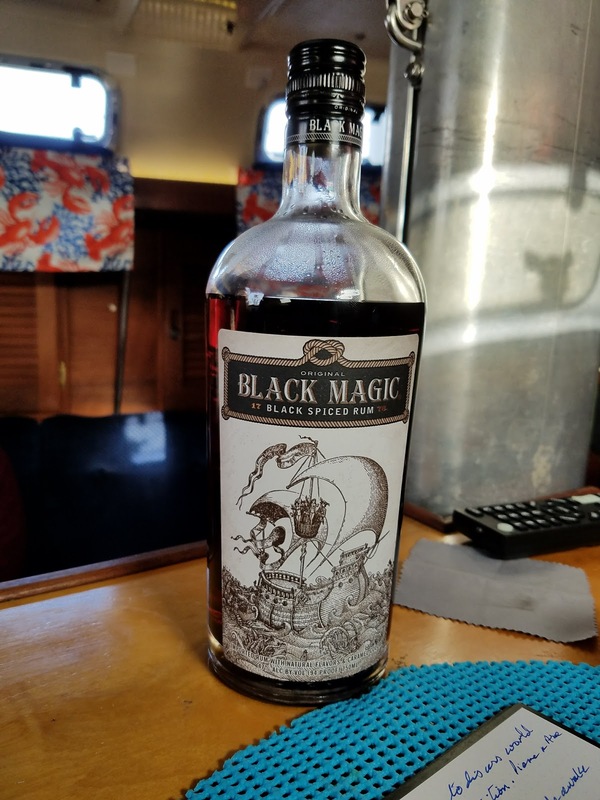 This will become a staple in my liquor cabinet (the cupboard just forward of the galley counter) displacing Pussers Rum - I'll have to keep the bottle out of sight when we have visitors. It's a really smooth rum and makes a great Tot - 1part Rum, 2parts Water. Pierre & Asa aboard Charity called and we agreed to have them raft up on our Starboard side, I think they arrived about 5:30pm. Once they were secure, they went below for dinner and we for ours. Rana - 3 Cheese Ravioli, bathed in Olive Oil & Parmesan Cheese - Delicious. After dinner we hopped over to Charity to solve the world problems. Charity is a really nice boat, very visitor friendly and Pierre & Asa take good care of her. Friday morning, Charity left after breakfast around 8ish. We prepped Eximius to leave before 10am just to be safe as the lake has a few skinny places near the exit, but we had no issues. We motored out of Port Everglades. 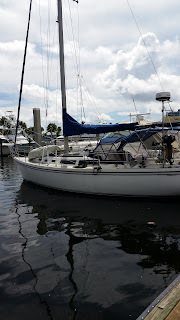 Our plan was to test the waters and if it was ok, then we would sail up to Hillsboro Inlet, if it was too rough then we would duck back into the port and motor up the ditch. It was an unusually smooth ride out of the Port Everglades channel, once clear we turned North and raised the sails, then turned East North East. Conditions were perfect! There was a large swell mostly about 5' swells with occasionally 8-10' swells, but they were very low frequency and Eximius climbed each without effort and didn't rush down the back sides. 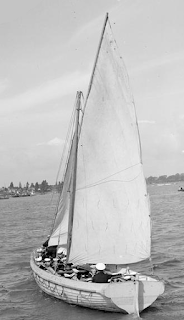 It was a beautiful sail, but it was Peggy's first in big swells and she was worried that they might get bigger. Personally I was delighted how well the boat was handling the 15-18 knot winds under a single reef and barely any heel, average around 5º. 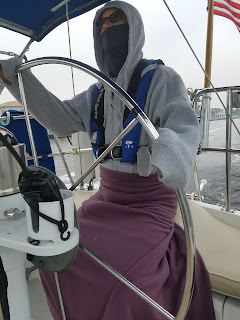 I had hoped that we would sail towards the NE enough to easily make a tack East South East to Hillsboro Inlet, but we turned early and clawed our way East by East North East. We made it to Atlantic Pier then turned North and dropped the sails while motoring the rest of the way to the Inlet. Hillsboro Inlet was Busy! The tide was rising and a lot of sports fishing boats were returning and a few much bigger boats were waiting to exit. The bridge opened a few minutes late because of Road Traffic, so we made a dash to keep up with the other boats. The bridge confirmed we were ok to go through and a large yacht, about 75', was going to wait for us to clear before they came out through the bridge. As we approached the bridge from the inlet, some boats were jumping the gun and exited before we had cleared the bridge. The inlet can get pretty choppy when there is a lot of traffic on the water, it got really choppy as we came through. But the boat handled it really well. A lighter boat would have had issues, but Eximius just pushed her way through the waves. My confidence in the way the boat handles grows every trip. Once inside, we turned North up the IntraCoastal timing our arrival at Hillsboro Boulevard Bridge and Camino Real Bridge. Arriving at Lake Boca we found it was crowded, we had to eke out a spot to anchor and hope that a lot of the boats would depart before Sunset. They did! We had a really quiet night. Chilli for dinner and Apple Pie for desert, I couldn't find the Ssshhhh (Dairy Topping) for the pie, but it was fine on it's own. Time for a Tot before turning in for a sound sleep. It started to get colder as predicted. We had extra blankies. 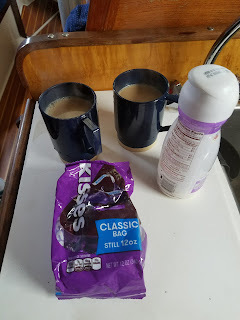 Saturday morning got off to a great start, after breakfast, we tided up the cabin in anticipation of guests coming aboard later that date, then had a second Cuppa-coffee. The boats from yesterday were all gone and the anchorage was clear, just 7 boats, mostly sail, including us and Endeavor - We tried to hale Jeff on Endeavor, but could see that he was busy working his boat - it's a Sailboat - of course he was doing work on the boat! I decided to shoot a video and post it to Facebook, so while Peggy warmed up with her coffee, I went topsides onto the bow to scan the lake. Upon our return, I realized that the Video says we're on Lake Sylvia - Duh! It's Lake Boca! We wanted to take a shower before other boats arrived, so we started to run the engine - SQUEAAAAAAAL !!! Shut down the engine quickly! I removed the engine cover (Steps) and we tried to restart again, same squeal, shut down in less than a minute. I felt the Alternator drive pulleys and they were too hot to touch, but no sign of any wear or damage to the drive belt, possible Alternator bearing failure. It could be either the Alternator (my first suspect), the Raw Water Pump (noticed a small oil leak but nothing really bad) or the Engine Coolant Pump. Removing the drive belt that unites the Crank Shaft, Coolant Pump and Alternator, I could not detect any significant wear on the belt, no obvious heat damage. Because the Alternator shares the same drive belt as the Engine Coolant pump, we cannot run the engine without the belt, that would prevent an Alternator Seizure, but it would result in an overheated engine - much worse! So, with much reluctance, we decided to cut the weekend and get a Tow home. This would be the first tow since we have owned a boat here in Florida. 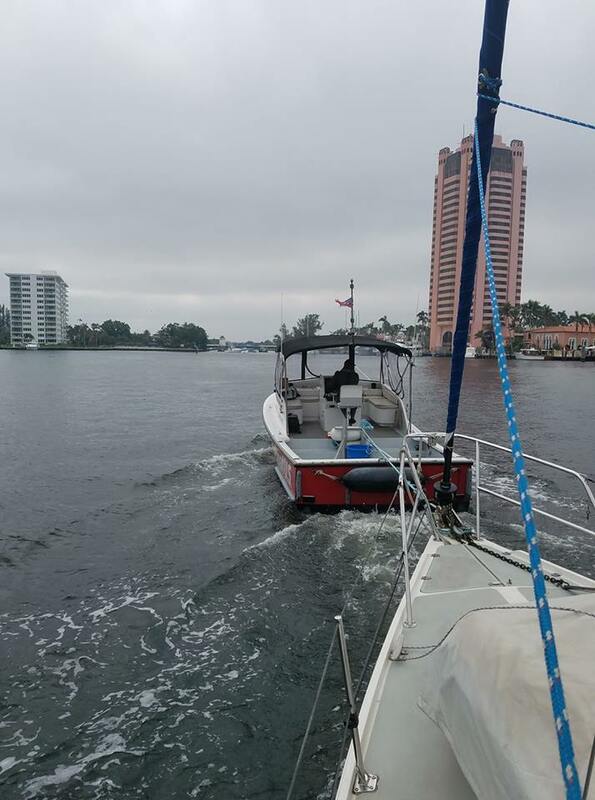 It's a 15+ mile trip from Lake Boca back to our dock in Fort Lauderdale. I called Tow Boat US via Mobile Phone, answered right away and quickly determined that we were Boat US Members with Unlimited Towing (WooHoo!) and that there would be no charge. Past reviews of towing incidents have led me to believe that the fee normally covers from when the boat leaves the dock until it gets back to it's dock. I guessed it would be between 4 & 6 hours for us, but Tow Boats have the advantage that the bridges open on request rather than the tow having to wait till the bridge opens which can be up to 30mins per bridge down here. Jean from Tow Boat US passed over to the local representative and Maria quickly took down our location and destination and then advised us that 'Cap't Cole' would be with us in about 20 minutes. While waiting, I pulled up the Anchor Snubber and we prepared the boat to get underway. We soon saw a Boat US vessel on the South side of the lake and I wondered if they were looking for us. But, after contacting Boat US, they advised that he would be with us shortly, another boat had hailed him en-route to us and he was just taking down their needs before heading over to us. Shortly after 2pm, we were attached by a bridle to the Tow boat and heading out of Lake Boca, just as we were getting connected, we saw Paul Malone arrive in his new Catamaran - very nice! But then we were underway following like a dog on a leash behind the tow boat. Cap'n Cole asked that we steer to follow him, so we manned the wheel all the way home. The trip down the ditch was pretty much without incident, except for our speed. Most of the trip we were doing about 6.25 knots, which is about the most we do normally through the water at 2,000 rpm. As some of the bridges were open upon our approach, they kindly stayed open till we got there. Then Cap'n Cole throttled up to minimize the delay to the bridge closing to allow road traffic. If you click on the picture to the left, you'll see our Speed through the water was 8.51 knots, however that was not our best speed, we touched 9.4 knots a couple of times. That tow boat has some serious power! During the two, I put the engine in Reverse to prevent the prop spinning, I wasn't sure if that was the best option, but I did not like the prop spinning with the engine in Neutral. 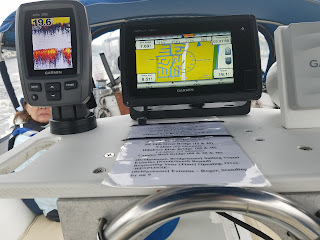 Oh, that list that you can see in front of the GPS is our Bridge List, one side has the ICW bridges from Lake Boca to Port Everglades, the other has the Bridges on the New River. 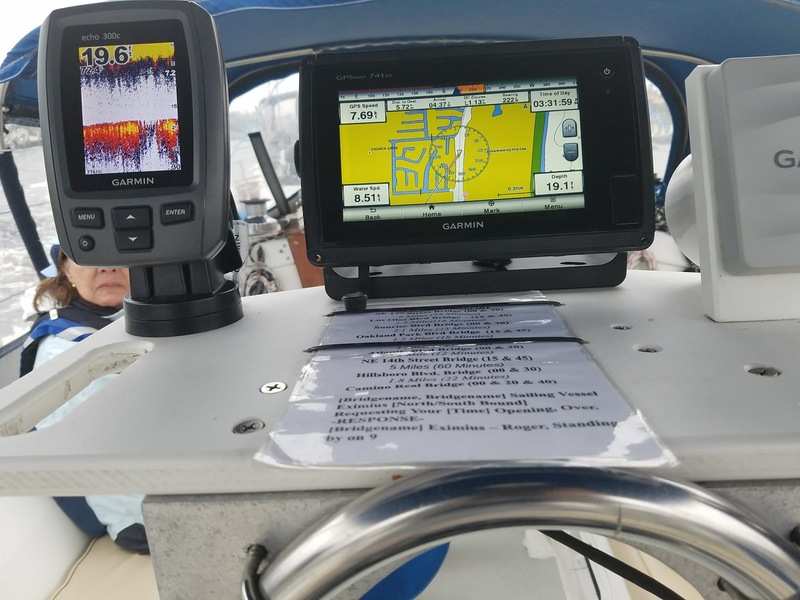 The Dispaly on the left show our Depth via the Garmin Echo Fish Finder/Depth meter. Our primary Depth instrument is the main display that is fed data from the Depth/Speed/Water Temperature transducer that is in a through hull inside the base of the Head Cupboard. Ok, back to our trip home. As we motored down the Intra Coastal, it was cold! Peggy was all wrapped up, and she pulled a blanket off the V-berth to keep my lower half warm. It was 62º F lower when you figure in the Wind Chill - Heck! This is South Florida! I should have put on my Foul Weather Jacket, it would keep the wind out, and my Foul Weather Pants would have made a big difference, but, as I said, Heck! This is South Florida! We may not get Snow down here, but folks do know how to celebrate Christmas. This cheery dock brought smiles to both of us. Under Tow, we continued down the ICW and turned West into the New River at Sand Bar Park. Cap'n Cole announced over VHF on Channel 9 that he was headed up river with a 34' sailboat in tow. As we had neared the New River, we heard several Boat Capn's complaining about the closures of the FEC Railroad bridge between Andrews Avenue Bridge and 7th Avenue Bridge, their complaint was the bridge was down for about 15 minutes but no trains passed over the bridge. We were approaching 3rd Avenue Bridge when two other Boat US tow boats were moving, empty, our way. Cap'n Cole decided to hand us over to one of them which meant switching the tow between the two boats. And this was going to happen between 3rd Avenue bridge and Andrews Avenue Bridge, during busy water traffic time! And both sides of the river were occupied by boats tide up to the walls. Cap'n Cole easily turned us with us turning to follow by applying appropriate rudder. Now we were facing 3rd Ave bridge. The second Boat US tow went alongside Cap'n Cole's boat and the new skipper, Cap'n Jon, passed me his bridle. We quickly swapped bridles and Cap'n Cole headed off back to the East. Cap'n Jon turned us again once the Andrews Avenue Bridge began to open and we towed through without issue. The FEC Bridge was open, but when I checked the Time on the Digital Sign board at the FEC bridge fenders, it read "4:47" but GPS time was 4:53, perhaps it's Train Time! 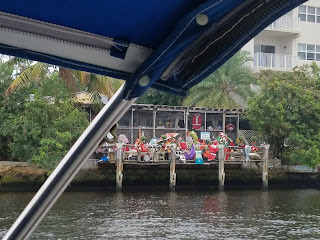 As we approached our home dock canal, I pointed out to Cap'n Jon that we had to take care to avoid the overhanging trees, he considerately kept us away from the trees with Peggy at the helm while I prepped the boat to come alongside. Cap't Jon eased the bridle as we neared the dock and Peggy was able to steer us parallel to the dock, close enough that I was able to easily step off the boat to the Dock. She Aced it! We both thanked Cap'n Jon, and he reversed back down the canal. Within an hour, we had unloaded the boat into the truck and were on our way home. Had we or motored back from Lake Boca ourselves, we could have made it as it was Saturday, but on Weekdays, the bridges lock down during Peak Road Traffic 16:30 - 18:00 and that would have been a challenge. 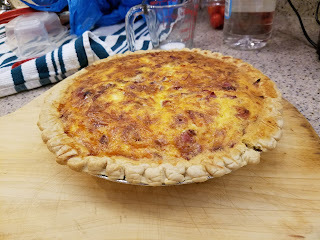 Once home, we unloaded the food, put some wine in the fridge, took a shower, and enjoyed some of our Quiche that was intended for the Party on Sunday. The Mail had arrived in our absence, Peggy brought it in while I showered. Despite our First Tow, the sail on Friday was Awesome! I could have kept going all the way to West End. Sunday we went back down to the boat and removed the Alternator, then brought it and our spare Water Pump home so that I can service the pump and take the Alternator to a shop in Fort Lauderdale. I'll also take our old Alternator, think I'll carry that as a spare! Never can have enough spares. Thanks to everyone that was involved in helping us get home, Jean & Maria from Boat US, Cap't Cole and Cap'n Jon, Jeff Miskin with advice about getting the Alternator Fixed, Chip Packard for offering to help out with Spares. And to the rest of the Members that took up the slack when we dropped out of the New Year's Eve Cruise. I mentioned that this was the first time we have had a tow, but it's not my first ever tow! Picture from Imperial War Museum. 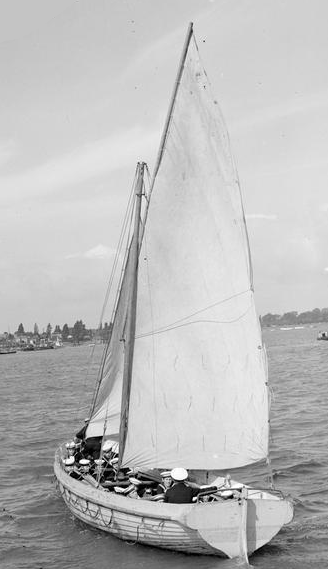 In 1965, while at the Royal Navy Training Establishment 'HMS St. Vincent' Gosport Hampshire, I was Cox'n of a Royal Navy 32' Cutter in a Race off of the Southsea Shore. The wind was barely, and our Rudder pintle broke. We had oars and could have rowed back to the boat dock but it would have taken several hours. The Race committee tugs ended up pulling us and a couple of other boats back to base. DNF! Not a bad record - 2 Tows in 52 years! Now to get the boat fixed in time for Haul out two weeks from today.